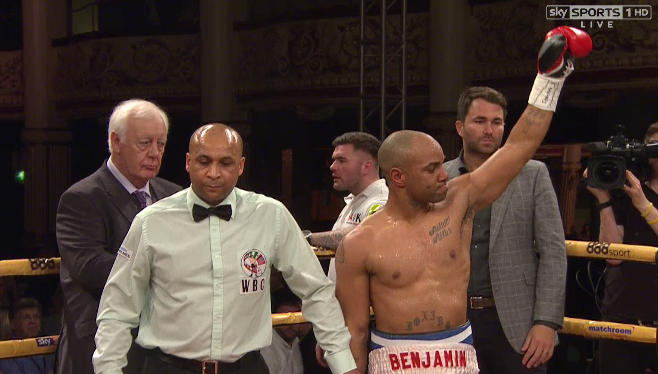 Carson Jones controversially stopped Brian Rose in the first round after the referee called a halt to proceedings with the Blackpool man not taking the amount of punishment to suggest a stoppage was necessary. With the Blackpool crowd revved up in anticipation of their hometown hero's all important fight with loss not thinkable. Rose came flying out of the blocks, with big solid right hands finding their way through the guard of the visitor. However, proceedings swiftly went from comfortable boxing to a disaster for Rose who plunged onto a slick right hand from Jones around the ear. The Blackpool man staggered and covered his face with gloves held up high but a revved up Jones pouring on a vicious onslaught. As the home favorite backpedaled with a ruthless American pummeling his jaw with solid shots. Official in charge Ian John Lewis had a clear view of action taking place and when Rose's legs wobbled the referee swiftly called a halt to proceedings with a stunned crowd - some not quite sure what was going on - and others vocally debating the actions of Ian John Lewis. The fight had been called off, with Rose's mind all over the place shortly after being rocked but also such a controversial decision playing a part in that. Jones celebrated, and in his post fight interview the American stated that he would be more than happy to stage a rematch with Rose after clear controversy. An angered Brian Rose frustratingly trotted off backstage where he would boot chairs, flip a table and vocally let his feelings known as his trainer quickly asked for the Blackpool man to calm down. Afterwards, the Matchroom fighter expressed his sadness and frustration of what had just happened with a heated debate surrounding Ian John Lewis' decision taking place. "I buzzed him (Jones) so why not give me a chance?" Rose, who previously stated before the fight saying a move back down to domestic level doesn't interest him demanded an immediate rematch with Carson Jones.